Business companies must have the cash to run. However, some companies may find themselves in a situation where they have no money. Additionally, companies may have money, but it may not be enough to carry out particular operations. Therefore, the lack of finances in the organization prompts an organization into borrowing money. There are many sources that organizations can obtain money from whenever they need to. However, it is imperative that an organization decides first what it intends to use the money for, and how much it will require. Upon making a decision on the amount it will require, the organization then decides whether it will go for short-term financing or medium-term financing. The short-term financing consists of the money that an organization borrows, which is to be paid back in a short period of fewer than three years. Short-term finances are obtained mainly to settle urgent matters. On the other hand, medium-term financing refers to the finances that one borrows with the expected time of repayment between the short term and long term. However, the fact that a medium-term finance lender always checks on the creditworthiness of a company makes medium-term finances scarce. This study will look into the short-term and medium-term financing of businesses (Stever, 2007). The study on short- and long-term financing is important because of the several reasons. First, the study enables one to know the difference between the short-term finance and medium-term finance. Secondly, the research is significant in that it facilitates one to know the different sources of financing available in the market. Thirdly, this research is essential to business people, as it enables them to know the right kind of financing to go for in times of financial distress, with the option of choosing short-term or medium-term. Businesses face financial challenges in any market conditions and may find it hard to find a source of cash to deliver it from financial constraints. Thus, through this study, one will be in a position of identifying the correct source of obtaining cash. The objectives of this study are very clear. One of the objectives is to understand what short-term and medium-term financing mean. Secondly, the study aims at identifying the sources of short-term and medium-term financing. Thirdly, the objective of the study is to analyze the two sources of financing and to provide a comparison and contrast of the two major sources of finance. As mentioned in the introduction, short-term finance is the money borrowed and repaid in a short time period, usually less than three years. With the short time of repayment, the lenders often take advantage of the desperate situation of the borrower and charge higher interest rates than those charged by the medium-term financing options. Some of the urgent activities, for which short-term loans are borrowed, including buying inventory, payroll duties, and business expansion. Short-term financing is easy to find. Some sources of short-term loans are bank credits, trade credits, customers’ advances, and installment credits (Masters & Skola, 2014). Trade credit refers to that amount of money that a supplier allows a buyer to stay with until a certain amount of the goods is sold. The option of supplying goods to businesses and not getting paid there and then, but at a later date, provides buyers with a trade credit. On the other hand, bank credits include loans, cash credit, overdraft, and discounted bills. An overdraft is a state whereby a bank permits a depositor to take out money from their accounts up to a certain limit. However, in order for an individual to get an overdraft from the bank, a borrower must have a good credit score. With the customer’s advances, business persons ask the buyers who have ordered something from them. The amount of advance payment is dependent on how much the goods ordered are worth. With the installment credits, business people can obtain money and repay later in fixed installments. Thus, lenders have to pay back through monthly or annual installments. Via the installment credit, businesses can obtain money they require to fix some minor issues in the business (Stever, 2007). 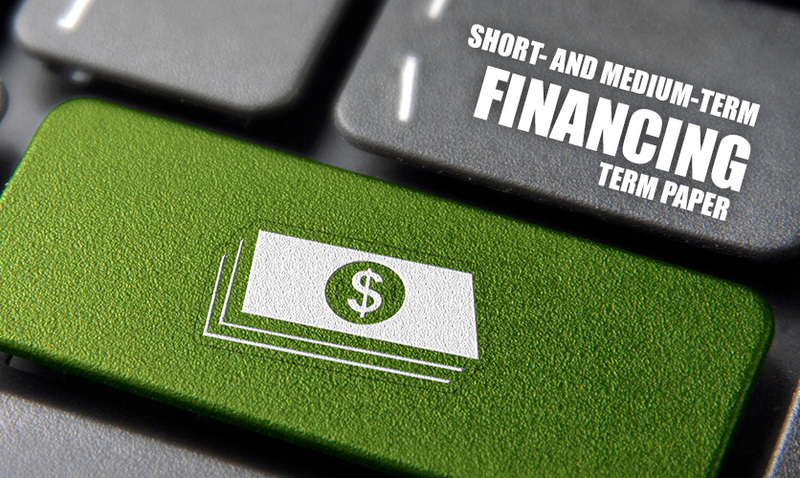 Short-term finances are more economical compared to the medium-term finances, which take longer to obtain. They are economical because when the borrower repays back, no cost raising is happening. Furthermore, the interest that a lender decides to charge on a short-term interest is payable, since a borrower has already decided how to pay back the loan. Additionally, short-term finances are flexible, as they can be raised whenever it is required. Since short-term financing does not involve giving a part of the business to a lender in order to obtain a loan, there is no interference in the business’s management. Management retains their roles and rights as decision makers in the business (Sharan, 2009). Moreover, short-term finances, such as bank credits, could become long-term options, as the borrowers could review the terms by extending the repayment period. However, short-term finances exhibit some drawbacks. One of the drawbacks is that one is meant to remit interest at the required time, regardless of whether the business makes a profit in the short period or not. This factor may strain the business a lot. Additionally, businesses may find it hard to raise short-term loans in case the business incurs huge losses that may end up negatively impacting the creditworthiness of the business (Masters & Skola, 2014). On the other hand, medium-term finances are loans, whose repayment time can take more than one year, but up to about five years. However, for one to be in a position of acquiring medium-term finances, they must have a good credit score. Low credit scores make lenders consider giving one a considerable interest rate. Medium-term finances are not necessarily used to settle urgent matters. Thus, they enable borrowers to spend a good deal of time searching and comparing different sources of loans in the market. Therefore, medium-term lenders will consider charging a little interest rate on the borrowers in order to attract them. Examples of medium-term finances include student loans, bonds, business start up loans, mortgages, and wedding loans. Businesses can source the medium-term finances through the sale of shares. Management could decide to sell a part of the company to the public so as to get the money it needs. The company loses some control of by selling part of the business in the form of shares. The reason is that the new owners have to be included in the decision-making process of the company. Hence, there is interference in the management of the operations (Masters & Skola, 2014). Another source of medium-term finance is the mortgage loans. Mortgage loans are usually received from the banks or credit unions. With mortgage loans, the lenders ask for collaterals so they can provide the loan. The collaterals are mostly assets, which in case of the borrower’s default or bankruptcy provide assurance for the lender. Furthermore, business could obtain medium-term finances from its profits. A business could reinvest the profits that it makes into the business, and later the profits can be distributed to the intended parties (Kochevar, 2014). Unlike short-term finances, medium-term finances are flexible. The reason is their extended time of payment. With the lengthened time of repayment, business persons could get money from other sources to pay back. Additionally, the interest charged on the long-term finances is split over a long period, enabling borrowers to pay back the loans with ease. Regardless of whether the business made any profits or not, the business person has to get money from the business to settle the short-term loans (Sharan, 2009; Subramanian, 2009). Unlike short-term loans, medium-term loans have the advantage of developing one’s credit because of the medium-term period of loan repayment. Loan borrowers use the money to build credit’s company so that the company can borrow huge amounts from other big loan lenders (Masters & Skola, 2014). Every company at some instance will require a boost in terms of finances form an external source. Thus, it is crucial for every business person to know the most suitable type of financing for his/her business. Ignorance of the various types of financing and their suitability to different situations may make one settle for an inappropriate source, which may end up ruining the operations of the business. Short-term financing is suitable for settling urgent matters. However, when a company decides to go for it, it should have decided on how to pay it back, since its repayment period is very short. On the other hand, medium-term finance has prolonged periods of repayment. It is also important that a borrower considers the possible consequences of borrowing. Additionally, the borrower should not just jump into a source of financing that he or she finds in the market. Rather, the borrower should identify the many sources in the market, compare them, and settle for the source that is the most favorable.